It was cold during the night and frost was heavy on the ground when I entered the main garden early this morning. Icy formations accentuated leaf shapes and stem structures, lending elevated status to the humble remnants of the garden season just past. In the meditation circle the frost’s silvery-white seemed to enhance the colors of the plants. 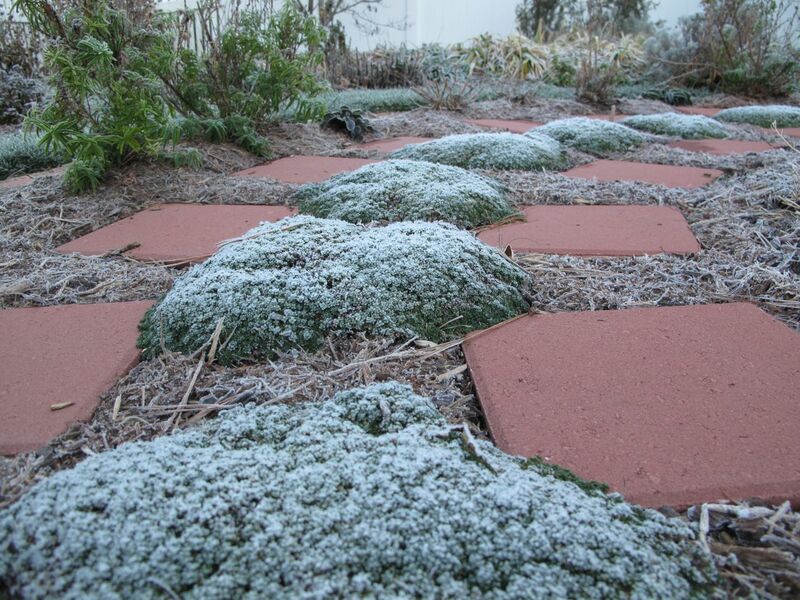 The textural contrast between hard red stepping stones of the path and soft mounds of thyme was made stronger by the thyme’s frosty coating. The weather is warming again for the weekend and into next week high temperatures will be in the sixties, but today there was a hint of winter. Last night the sky was clear for the annual Geminid meteor shower. Despite street lamps and traffic headlights in our neighborhood we were able to watch meteors streaking through the sky. Awesome! 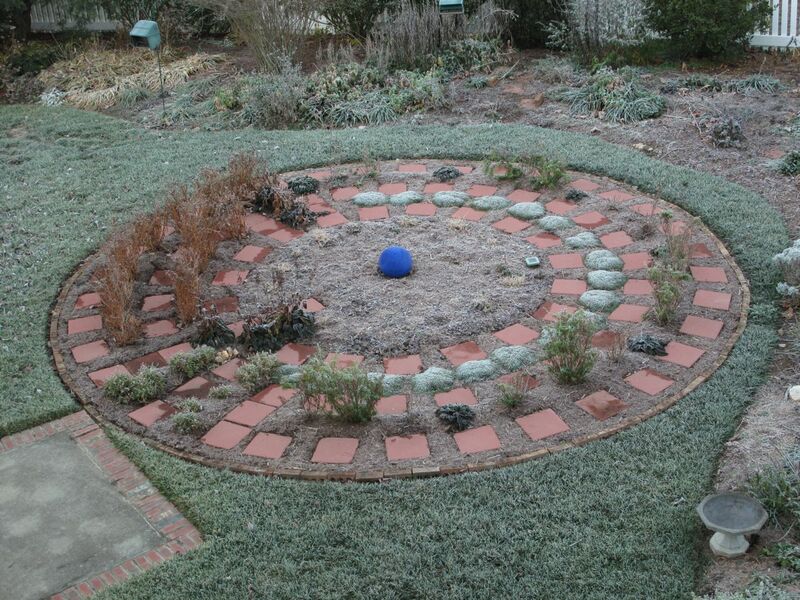 This entry was posted in garden and tagged almanac, frost, labyrinth, meditation garden, meditation path, nature photography, penstemon, photographing nature, winter garden on December 14, 2012 by pbmgarden. 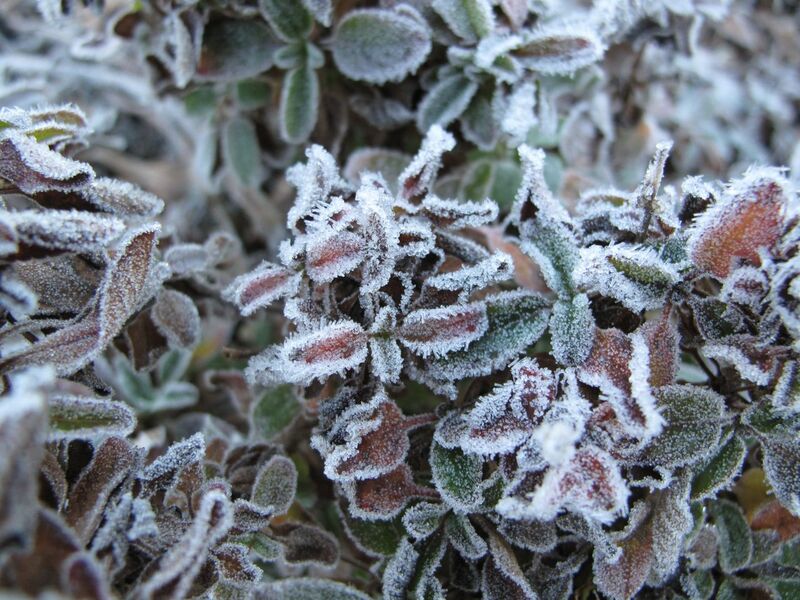 The thyme looks very effective with frost on it – in fact everything looks prettier dusted with white frost. Lovely images! The frost freshened everything. Thanks Cathy. 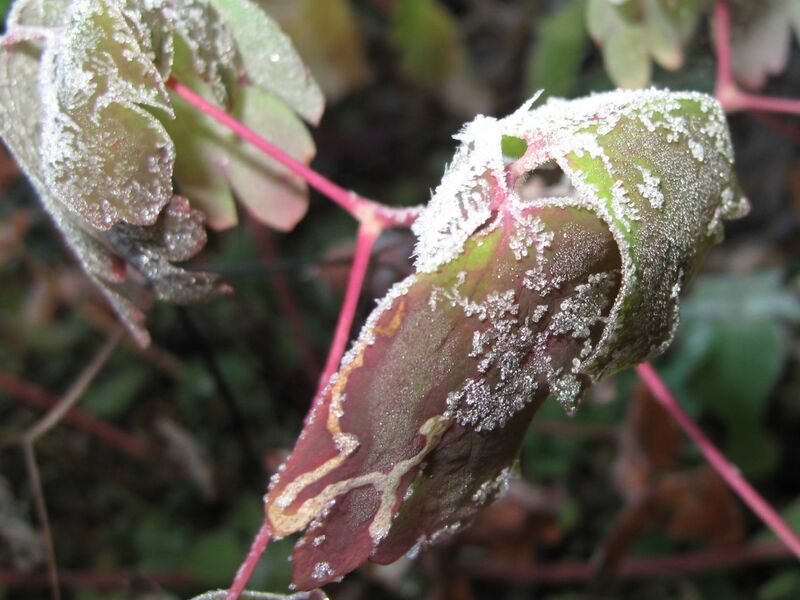 Frost certainly accentuates the patterns in plants, like a dusting of icing sugar, and makes everything look so pretty. You were so lucky to see the meteor shower, we had thick cloud and heavy rain, not a chance! Seeing the meteors was exciting. We always try to view them but as you experienced, the weather doesn’t always cooperate. Lovely post! I like the look of the time curling its way around the circle. Thanks. I came very close to removing the thyme early last spring because it fared poorly over the winter. So glad I procrastinated. Everything looks better with a coat of frost. It must be the latest fashion!! You’re right. It’s a great enhancer. I do love the look of frost-kissed foliage. It’s certainly a harbinger of things to come but it’s so fleeting. Great photos.